All of this functionality is jammed into a 62.3mm x 18.0mm board with all solder points on a 0.1" grid so you can slap it on a breadboard and get to work! 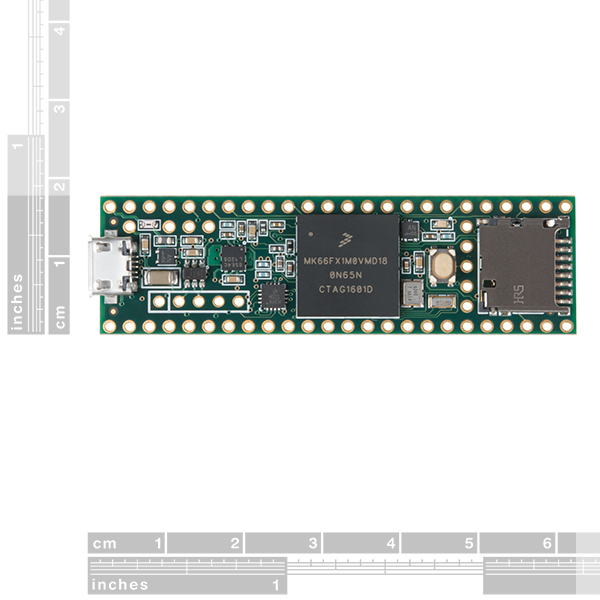 The Teensy 3.6 (as well as its sibling, the Teensy 3.5) is larger, faster and capable of more complex projects, especially with its onboard micro SD card port. 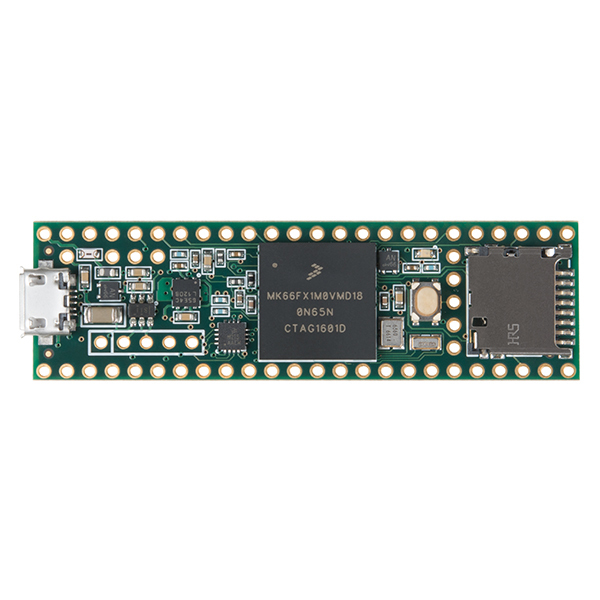 An upgraded ARM Cortex MCU (180MHz from 72MHz), more memory (1M from 256K), as well as more RAM, EEPROM and accessible pins make up the key new features of this "teensy" board. The Teensy 3.6 is slightly scaled up from the Teensy 3.5 but is offered at a higher price point, comparatively. Does anyone know if the Sparkfun LSM9DS1 Library is compatible with this board? With the addition of the FPU, I wish I was smart enough to implement a Kalman filter for IMU sensor fusion. This teensy little fella would fly nicely. Someday maybe. The video mentions using the 'octows2812' library. From what I've been able to find on PJRC website/forums/rest of the interent, the octows2811 library currently doesn't explicitly support the teensy 3.5/6 but I'd love to be proven wrong. I've been waiting with bated breath for the octo library to come to the newest teensy's. Any chance Nick (or anyone) could post up a link to the library used in the video and maybe even the code for running the animation shown in the video? Should work with all T 3.x stuff. Excellent! Thanks! While preparing a post over on Adafruit, I noticed that there were what might be a 32.768kHz SMD crystal over between the reset button and pin 25/pin 26, but the resolution of the pics available didn't allow reading the markings (and there's no schematic available, at least yet). The pjrc.com website isn't yet listing info about the 3.5/3.6, so was no help either. At $25 a pop, the 3.5 may become my "go-to" board, especially for data logging! I believe the description should read "... digital pins have interrupt capability and are 5V tolerant." Rather than 3.3V tolerant. 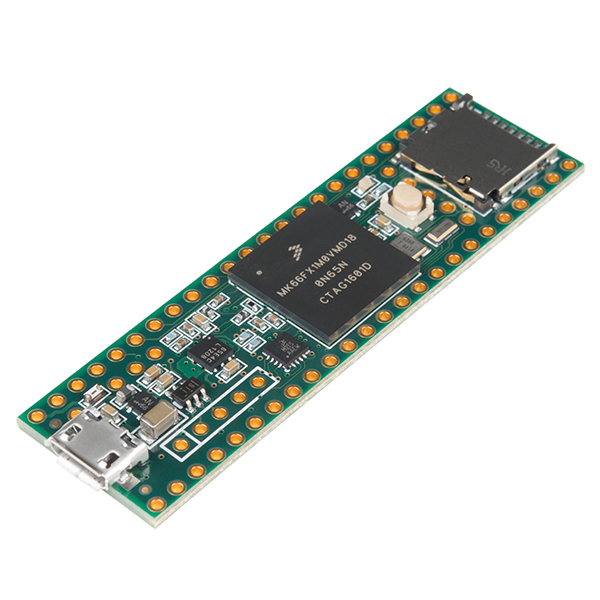 From pjrc website: Version 3.6 features a 32 bit 180 MHz ARM Cortex-M4 processor with floating point unit. All digital and analog pins are 3.3 volts. Do not apply more than 3.3V to any signal pin. Correct; AFAICT the 3.6 is 3.3V, the 3.5 is 5V tolerant. I have been using the Teensy 3.1 for quite some time and really like it. I saw the Teensy 3.6 specs and wanted to get one to play around with. I only just received the Teensy 3.6 so I haven't pushed it very hard yet but the board works as advertised and is awesome! 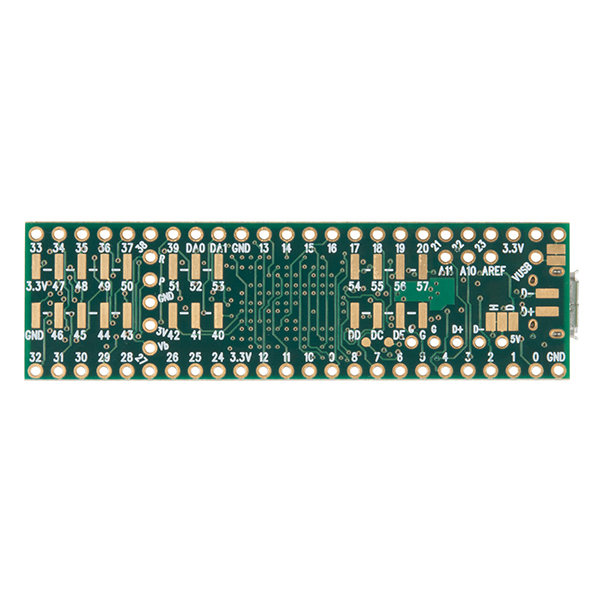 These boards are developed by Paul Stoffregen at PJRC; https://www.pjrc.com/ is his web site where you can find all kinds of information about the Teensy line of products. Thanks Paul! And thanks SparkFun, as always ordering and delivery were outstanding! You guys help keep my spark interests alive! wonderfull speed, easy to programming and really small!! There's a lot in this small package and the teensyduino environment makes it so easy to use! I use these boards for projects again and again. Also love how there are different price levels/sizes (Teensy 3.6, 3.5, 2, LC etc) most code being completely compatible. My favorite microcontroller in the world! PJRC has done an AMAZING job with the 3.6 and 3.5. I am going to talk to Sparkfun today about adding a few more stars in order to rate the Teensy appropriately. The hardware specs are just the tip of the iceberg. The forum is my favorite place to lurk and learn things, and whenever I have a question the incredible Teensy community has been beyond helpful. I totally recommend this for anyone who has gotten their feet wet with an Arduino. I use visual micro for visual studios to program this, and it has seriously been the best microcontroller programming experience I've ever had. Works flawlessly with the Arduino IDE. I honestly can't say enough about the T36. Get one, hit the forums, and make your project come to life! Let me highlight the great things first. The board is an almost drop in replacement for the Arduino. This board also extends the PWM capabilities, leaving Arduinos in the dust, not to mention having more ports than any board of its size that I have seen. I was able to port some arduino sensor code to this board with minimal code changes. Since my first thoughts on this board, more documentation is slowly coming out in relation to my uses, so 4 stars seems to fit. As a side note, I should also mention it was a bit awkward trying to solder on those headers myself... not a lot of room next to the main processor. I guess next time I should wait until the pre-soldered version is in stock, or if you are new to soldering. One more thing: are there going to be any -boards for the 3.6? The other add-on boards seem to work with the smaller Teensy boards only. Thanks for taking the time to read my rating. The pin layout on the first half of the 3.6 (and 3.5) is the same as the earlier, smaller Teensy boards, so many add-on boards should remain compatible. I just tested the Teensy Audio Board with the 3.6, and it worked flawlessly. First Arduino, easy to setup as it only needs USB. just installed the IDE and teensy drivers and it was up and running. It's easy to figure out, just got to remember that it's case sensitive and uses semicolons!